When it comes to traveling, especially foreign countries, I recommend you leave your watch at home. A watch is just one more thing that may catch the attention of a thief. In fact, I haven’t worn a watch in years. However, there are times when the right watch can be a critical survival tool. A couple weeks ago I was conducting a security analysis on a rural property. An old Army buddy of mine was in town and went out with me. About a half an hour into the analysis, the temperature dropped suddenly. My buddy and I both looked to the sky to see it darkening. “Storm moving in,” I said. Then he lifted his shirt sleeve to show me that he still had the old Suunto Vector that we both wore in Afghanistan. When I got home that night, I went to Amazon to see how much a new Suunto Vector would cost. It turns out that they are no longer in production. I still have the one I wore in Afghanistan over 10 years ago, but it’s worn out and has a broken band. This watch was simply a critical piece of gear in Afghanistan. It did two things that most other watches couldn’t do, at least not then. First, it provided an altimeter. Navigating in steep mountains can be incredibly difficult. While there are plenty of terrain features to check against your map, there are often so many that you may not be able to find one that stands out. For example, you might find yourself on a west pointing spur. Then when you look at your map, you may find 5 or 6 west pointing spurs that branch off of the same mountain you’re on. That’s when having an accurate altitude can play a big role. You may not be able to see it from your vantage point, but you may be on a sub-spur or have many sub-spurs below you and have no idea which you are on. For those who don’t know much about land navigation, one of the things you often do to find your location is called resection. This is where you find two points, shoot a back-azimuth, and identify your position by where the lines cross. In any wooded environment, especially in the mountains, it can be hard to identify 2 known points. However, if you know your altitude, you can use the elevation line, known as a contour line, as one of your resection lines. This means you only need to find one known point and shoot a back-azimuth. 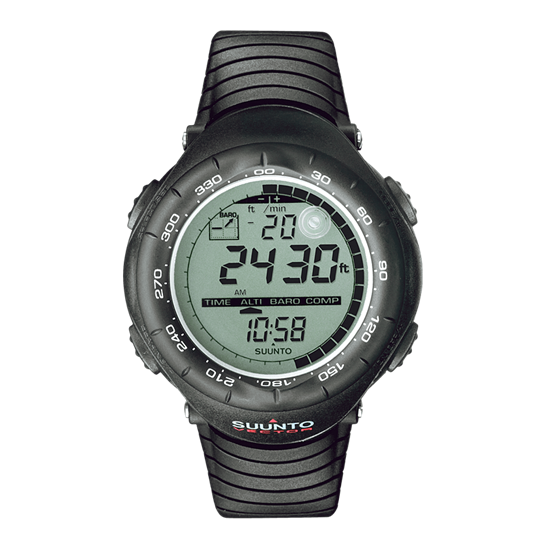 Suunto watches also provides barometric pressure. When living out in the wilderness, knowing that a storm is approaching can help you plan critical actions appropriately. In Afghanistan, I would check the barometric pressure at least once per hour. If the air pressure changed drastically, there was a storm moving in. Sometimes this just meant that I knew we were going to have a rough night and there was nothing I could do about it. But often this meant that we could stop our patrol early and set up a patrol base or find an empty “bonda” to crash in for the night. Bonda’s are what the local goat herders used to store their goats in when they stopped for the night. they were scattered around our area and we would often occupy them for our own patrols. They were essentially rock sheds with floors covered in goat poop. Oh, the spiders! As I mentioned, the Suunto Vector has been discontinued. While there is a little nostalgic regret, their new lines look amazing. I thought about going into how to determine if a storm is coming using barometric pressure, but it turns out that the new models have built-in storm alerts. And their new lines have GPS built in. So now, not only do you get the altitude, you can also see your tracks. This feature alone could save your life if you get lost out in the wilderness. Just reset your tracks before you start into the wilderness and you should have no trouble finding your way back. While I’ve never used this particular watch, I would be comfortable buying one. I’ve owned several Suunto watches and compasses over the years and I’ve never had a problem. And from the other reviews I’ve seen, it looks like this watch is just as high quality. So if you’re in the market for a new watch, consider one like this. They make several others that may fit your style better if you’re a fancy dresser. I’m hoping to pick one up for myself on my next trip back to the U.S.
Would the GPS feature being open to exploitation by a third party? Yes, there have been many examples of phone GPS systems being used to track people. I leave mine turned off unless I’m actively using it and I recommend you do the same. However, keep in mind that your phone can also be tracked using cell tower and wi-fi connections. This is less accurate and generally requires government involvement in the form of a warrant, but if you’re concerned about the government, it’s something to keep in mind. The only way to avoid this one without ditching cell phones all together is to have a phone that can’t be traced to you. No social media or email accounts, no credit cards, no purchase records. For the most part, I don’t think most people have anything to worry about. But if you do, using cell phones can become very tricky.